Reconstruction of Edmontonia rugosidens by E. M. Fulda. The Ankylosauria is a clade of more or less heavily armoured, quadrupedal, herbivorous dinosaurs that has been defined as including all taxa closer to Ankylosaurus than Stegosaurus. 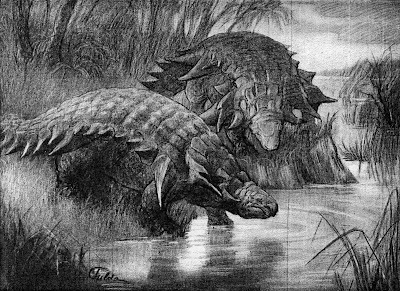 Most classifications of ankylosaurs have recognised the families Nodosauridae, with relatively slender snouts, and Ankylosauridae, with broader snouts and often with a large bony club on the end of the tail. Synapomorphies (from Vickaryous et al. 2004): Skull with cranial ornamentation present across rostral region and lateral surface of angular; antorbital, supratemporal and external mandibular fenestrae absent; maxillary tooth row inset from lateral edge of maxilla; multiple parasagittal rows of osteoderms present across dorsal surface of neck and postcervical region of body; acetabulum imperforate; synsacrum composed of co-ossified dorsal, sacral and caudal vertebrae. [XWY01] Xu, X., X.-L. Wang & H.-L. You. 2001. A juvenile ankylosaur from China. Naturwissenschaften 88: 297–300.